I don't normally cross-post the material I write for OnMilwaukee.com. 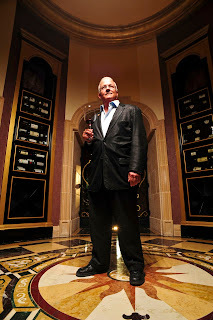 But, this past week I had the rare opportunity to have a conversation with Eddie Osterland, the United States' first Master Sommelier. He was in town for a speaking engagement and offered to sit down and chat with me about ways average people can take their home and restaurant entertaining to the next level. Not only is Eddie just an all-around nice guy. And honestly, I learned a ton. Turns out you don't have to know everything about wine to surprise your guests with impressive food & wine pairings. And you don't need to be rich to throw a great party (though spending a few extra dollars helps). You just have to learn how to think more like a sommelier. Wine geeks might recognize the name Eddie Osterland. He was, after all, the first American to attain the Master Sommelier title in 1973, and is now one of fewer than 200 in the country. And just to give you a sense of how big of a deal that is, less than 3% of test-takers pass the exam, and there are less than nine sommeliers worldwide who passed the Master's Exam on the very first try. So, Osterland is pretty special. The fact is, if he were a wine, he'd be a grand vintage, fully mature but with plenty to offer for years to come. These days you'll most often find him on the speaking circuit sharing his knowledge about wine and entertaining with both new and seasoned executives. In fact, his new book, "Power Entertaining," is a collection of his experiences and advice for building lasting relationships and using the art of wine and food to impress and attract friends and business associates. I had the great honor of sitting down with him while he was in Milwaukee for a speaking engagement last week. We talked wine, relationships, and entertaining. And he gave me some great tips for creating memorable experiences, both at home and out in restaurants. According to Osterland, creating a memorable experience has everything to do with "thinking like a somm." Before I jump full swell into the details of our conversation, what exactly is a somm? I like to think of the word "somm" as a term of endearment of sorts. The sommelier is typically a role found only in first-class restaurants where the price of a bottle of wine can easily dwarf any sum spent on food. Sommeliers are on the front line of customer service and profit generation. These talented folks not only know wines, but they know people. If they work in a restaurant, they know how to give even the pickiest customers the best possible service and keep them coming back for more. So, now that that's out of the way, it's time to start thinking like a somm. Osterland, who studied professional wine tasting for two years at the University of Bordeaux, says the first step to being able to pull off an impressive affair with wine is to calm down. It doesn't really matter how much you know about wine. "Don't stress out," he says. "You don't need to know everything. Make friends. Bond with the sommelier and your area wine merchant. Find out who the top ones are in your city. Get to know them, and find someone you like. Trust them." A little bit of education helps as well. "Go to a sommelier and say 'Burgundy me,'" Osterland suggests. "Sample the great wines you've never had before, and let it change your perspective." Build a relationship with the sommelier. If you're planning an event, meet them for a conversation a few weeks ahead of time. Have a conversation over drinks at the bar. Ask them what they have that's not included on the wine list. Once you've got the somm on your side, you can start thinking about how to orchestrate a dinner that friends and business associates won't soon forget. Osterland emphasizes that, when you're pairing wines with foods, whether it's at a restaurant or at home, keep in mind that both taste best when you're hungry. "No matter how much you like that lobster or scallop dinner, it's going to taste at least 8% better if you're hungry. Once that first item goes out, you have fifteen to thirty minutes to rock 'n roll. So, start with what really shines." Osterland says it's a bit like the concept of "eat dessert first," and he follows up with the example of the legendary white, Château d'Yquem. Ranking among the top five white vineyards of France, Yquem is a highly regarded wine with ancient origins. He says it's unconventional, since it's typically seen as a dessert wine, but he suggests serving it first.